I've bored you lot to tears about my love of Christmas music so many times, that I've taken my pet subject off to a completely different blog to hold forth over there instead. It's part of Uborka's "Yulevent", where a different guest blogger holds forth every day about what Christmas means to them. It's well worth a look, even if you're not interested in reading me holding forth about Joseph Spence....AGAIN. On the off-chance that you are interested in my obsession with seasonal music, then I will take this opportunity to tell you that I've not had a great deal of luck with this year's new releases. Last year was a bumper year, bringing me the wonderful "Tinsel and Lights" by Tracey Thorn as well as the discovery of classics like "A Charlie Brown Christmas" by the Vince Guaraldi Trio and the surf guitar instrumental versions of seasonal staples by The Ventures. This year seems to be mainly Mary J Blige, Susan Boyle, Leona Lewis and Kelly Clarkson. Probably not quite what I'm looking for. Nick Lowe might be worth a listen though. Mind you, on the plus side, there's decades worth of pre-Slade classics to discover. This year I've been mostly listening to Louis Armstrong, Ella Fitzgerald and Johnny Cash. I love Johnny Cash, of course, but I think it's fair to say that these songs seem to come from deep within his religious phase, and he does rather go on about the Big J.... still, if he is going to go on about that stuff, then at least he does it in that magnificent bass voice. As for Louis... well, it turns out he's quite the fan of the season. Listening to him growling and scatting his way through a number of tunes, and suddenly it's not so very hard to see where our dear old friend Joseph Spence was coming from. 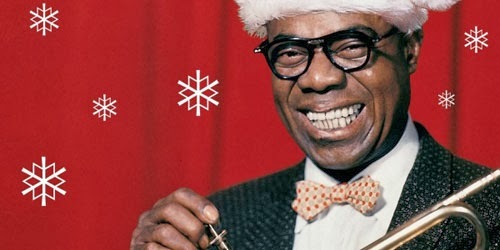 His Sandy Claw and Satchmo's Chrizzzmuzz are definitely related. I'm still looking for a copy of the Trojan Christmas boxset, which isn't available in the UK. Ditto the Weezer Christmas Album from a few years back. Both are available on iTunes USA and Amazon.com... but not here. Perhaps I'll be able to pick them up when we're in New York in January. I'd like to get'em legally if I can. Music has worth, innit? Oh, look at me. I'm off again. Anyway - you can read my post on Uborka HERE. I'll shut up now. I'm out on Friday, so you might not get a list of festive earworms.... so make the most of this festive good cheer whilst it lasts, eh? We'll soon be back to Morrissey and Metallica. Oh - I've produced a Spotify playlist for this. Hope this works, but you should be able to find it here.